Hyundai Motorsport have started testing a new rally car based on the new generation i20 with French driver, Bryan Bouffier putting the car through its first shakedown at its private test stage in Germany. This is the first of a series of test for the new car and aimed to check all the systems while also starting to collect valuable test data. Hyundai Motorsport team principal Michel Nandan commented,"It's always an important moment when you take a car to the road for the first time and this one was no exception. We have been working on the development of our future WRC car for some time now and we were finally able to put the first prototype on its wheels." The new rally car throws the team a new challenge as it's completely different platform that is longer, lower and wider with a new engine and transmission. This is the beginning of a long process and they will continue to develop the car through 2014 and 2015 till they are sure the package is ready to compete at the top level of the sport. The current i20 rally car is still in its first year of full competition and Thierry Neuville, the leading driver is currently fifth in the Driver's Championship after eleven rounds while Hyundai is fourth in the Constructer's Championship standings. Hyundai Motorsport has carried out the first roll-out of its next WRC car, based on the New Generation i20 Bryan Bouffier tested the car for the first time on a private testing ground last month The team will continue development of the car with a series of tests scheduled until the end of 2014 and throughout 2015. 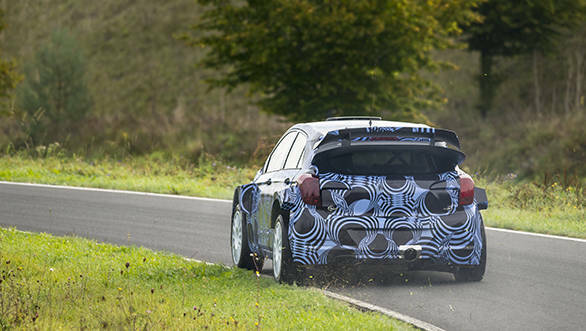 Alzenau, Germany October 8, 2014  Alongside its participation in the 2014 FIA World Rally Championship (WRC), Hyundai Motorsport has recently rolled out the first prototype of its next WRC car, which is based on the recently-launched New Generation i20. French driver Bryan Bouffier carried out the very first shakedown of the car on a private testing ground in Germany last month, with the aim of checking all systems and to start collecting valuable data for upcoming development tests. Based on the New Generation i20 - Hyundai's third-generation B-segment vehicle is a completely new car compared to the current model - the WRC version incorporates all the learning and valuable feedback that the team has collected during its first season in the World Rally Championship. Hyundai Motorsport Team Principal Michel Nandan commented: "It's always an important moment when you take a car to the road for the first time and this one was no exception. We have been working on the development of our future WRC car for some time now and we were finally able to put the first prototype on its wheels last month. The data and experience that we have accumulated during our debut WRC season has contributed to our approach with this new car. We will introduce it in competition when we are absolutely sure that it is ready to replace the current Hyundai i20 WRC  we're not in a rush. It's a totally different car compared to current WRC model; the platform is different, the car is longer, lower and wider and it features a new engine, transmission and other components. Of course we are just at the beginning of a long process and we will continue to work hard on development and continue testing in the next months and throughout 2015."